So you’ve decided to take the plunge and learn Spanish. That’s fantastic, but you may find yourself asking the question many people ask. Where do I start? What’s a wanna-be Spanish speaker supposed to do? Every week I meet Spanish students and speakers that ask me “How did you learn Spanish?”. Nearly everyone finds the answer quite surprising. Autodidacta means self-taught. Most people are surprised to hear that I never stepped foot inside of a traditional classroom. Nor did I live in a Spanish speaking country. In fact, I’ve never even done an immersion course. So how did I learn Spanish? I primarily learned how to speak Spanish by using audio courses and podcasts. In fact, audio courses were the foundation of my learning. My “classroom” was the driver’s seat of my car, my textbooks were CD’s and the podcasts I downloaded religiously to my MP3 player. (1) They’re portable. Put them on your phone or MP3 player and you can take them everywhere. (2) You can’t get the amount of instruction in one class that you can from an audio course. (3) Compared to classes, they’re amazingly inexpensive. (4) You have 24 hour instruction available, anytime of the day or night. (5) If you want to go through the material a second time, you don’t have to pay again, you just start over. There are advantages to being in a classroom and having a teacher, but I decided to put all my eggs in the autodidacta basket and it paid off big time. Let’s talk a little more about audio courses. It should come as no surprise that a trip to your local bookstore or a Google search will turn up an obscene number of products all promising to help you learn Spanish with their magical CD’s. The question now becomes which one(s) should I buy? To answer that question we need to know what to look for in an audio course. You can find plenty of quality products but that doesn’t mean they’re going to get you any closer to your goal of becoming a genuine Spanish speaker. Sure, you may learn a few things, but that will be about it. You need what I’m going to call a foundation course. (5) Use the listen and repeat method. This really drives the material home. There are many courses available and more being released everyday, but I’m only going to talk about the ones I used, because they meet all of the above criteria, especially #6. And more importantly because they worked for me. I have to admit, when I first started learning Spanish I didn’t know what I was doing or what I was looking for, much less what I actually needed in a Spanish course. In fact, most people don’t, especially if it’s your first foreign language. I started with an audio course called Learn in Your Car Spanish: The Complete Language Course. I learned quite a bit, mostly the basics, numbers, days of the week, etc., a few verb conjugations and some phrases that I just flat out memorized. It was really cheap and it got me started. However, even with it’s 4 star rating, one trip to Mexico later I quickly realized it hadn’t even come close to teaching me how to speak Spanish. Several months later, along with more wasted money on numerous Spanish books, I somehow came across Learning Spanish Like Crazy. In all honesty, when I first bought this course I listened to it for maybe 30 minutes, put it down and walked away from it for the next 2-3 months, maybe longer. That was the (first) biggest mistake of my Spanish speaking career. After another trip to Mexico I decided to pick it up again, probably out of desperation. I was thinking “well, I paid for this damn thing so I may as well use it”. It wasn’t long before I realized I was sitting on a gold mine. Let me tell you a little about the course and what I like about it. To start off with, it’s a $99 download (at least it was the last time I checked) and it consists of 30 lessons. That’s a bargain, trust me. Over the course of those 30 lessons, (each one is 30 minutes or longer) they cover a lot of ground. They take you from “Hola cómo estás” all the way to the subjunctive tense. By the time you finish this course you’ll have an excellent foundation and be able hold a fairly decent conversation. Learning Spanish Like Crazy will drill the verb conjugations into your head like no other course will. On top of that you’ll learn a ton of vocabulary. Each lesson introduces new verbs and vocabulary that you continue to review and build upon throughout the course. These aren’t old fashioned memorization drills, these lessons use native speakers that teach you each and every verb conjugation via spoken Spanish, in context, using the listen and repeat approach. I found the lessons engaging and if you put forth your share of the work, this course will have you speaking Spanish in no time. I’m convinced buying this course and then level 2 and level 3 that later followed it was the best money I ever spent. Anyway, don’t take my word for it, Everybody is different and what works for me may not work for you. Go to the website and check out the free lessons. As great of a course Learning Spanish Like Crazy is, it’s not the only option out there. There’s another course I recommend as a foundation course just as much as Learning Spanish Like Crazy and that course is Synergy Spanish. Synergy Spanish is all about teaching you what you need to know in the simplest manner possible to get you communicating with Spanish speakers as quickly as possible. Developed by Marcus SantaMaria, Synergy Spanish is in my opinion, one of the best courses out there. I’d rank it in the top 3 without hesitation. Marcus explains everything step-by-step and making it nearly impossible not to learn Spanish. As far as I’m concerned, the man is a genius. I used this course in conjunction with Learning Spanish Like Crazy and the two are a great compliment to each other. Take a look at Synergy Spanish, Marcus offers several free lessons you can try. I’m sorry there isn’t pretty image I can show you, but hey, no course is perfect. And last time I checked, the cost was around $60-70 and it’s also downloadable. 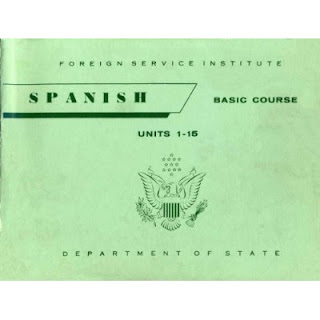 Another course that I qualify as a foundation course is called FSI Spanish. FSI stands for Foreign Service Institute. They developed numerous language courses (it’s an impressive list) that were and probably still are used to teach government employees. FSI Spanish is a very good course. In all honesty, I’ve only completed a few lessons, but that’s only because I found out about it about long after I completed the other courses and I already was several years into my Spanish studies with the courses I mentioned above already underneath my belt. You can download FSI Spanish here. Did I mention FSI Spanish is free? Yep, FREE. There are many places that will attempt to charge you for it (including Amazon.com), but it’s in the public domain so don’t pay a nickel a for it. Click on the links or the image above and download it for free. The course consists of over 50 lessons and is more than worth taking a look at. It covers all of the Spanish verb tenses, teaches a ton of vocabulary and is packed with lots of great drills to help you get a solid grasp on the language. I highly recommend it, especially in conjunction with one or both the courses I mentioned above. I know several people who have used all three. There are also two other courses called Platiquemos and Pimsluer. Pimsleur also comes highly recommended, and it’s a good course. It also uses the listen and repeat approach. 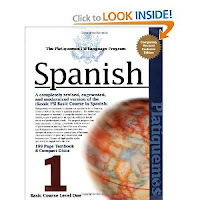 While you can find Pimsleur on Amazon, I recommend you check your local library first as it’s fairly common to find of copy of Pimsleur Spanish floating around. There’s another course I really like, and that’s Rocket Spanish. In my humble opinion, Rocket Spanish rides the line between a foundation course and a conversational course. 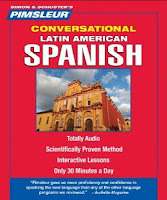 It gives you a gentle introduction to Spanish and does a good job of simplifying complex topics. I own this one too, it’s great stuff. You may find it more suitable to your learning style. 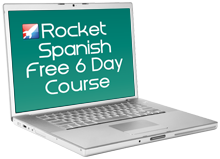 Click here and take a look at what Rocket Spanish has to offer. You probably noticed that I went a bit overboard as I own a copy of most of the courses I listed above. That really isn’t necessary and any one of these will really help you learn Spanish. My personal picks for a foundation course are Learning Spanish Like Crazy and Marcus SantaMaria’s Synergy Spanish. After those two I like Pimsleur and FSI Spanish. Yes, surprisingly, even to myself, I prefer the paid courses over the free one. But hey, free is free, so I recommend you download it and give it try. Well, I’m done. Evaluate the courses above and choose what you feel is the best option for you. I ended up buying several courses myself and found that they all complemented each other because each course offers it’s own strengths and presents the material differently. Got a suggestion for a good course that meets the 6 criteria above? Leave a comment or even better lets talk about it on the Helping You Learn Spanish Facebook page. If you don’t think any of those are good options for you, then take a good look around Amazon.com to find something that’s more your style, but yet fulfills the 6 criteria we identified as being necessary components of a good audio course. That’s enough rambling for one post. You can also read about my thoughts on the best way to improve your conversational Spanish.